Stormbringer 4th Edition - WTF? 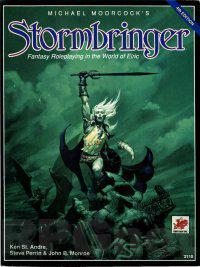 One of my favorite RPG books is the 4th edition (1990) rule book for Chaosium's Stormbringer. I've had my copy since around 1991 or '92, and I had a really good run of game sessions with my friend Terry (some of which I've previously mentioned in other posts) back in the early 90's. The book saw a fair amount of use, but I never could bring myself to detach the large fold-out map from the rear of the book. To this day, my book is in great condition, map still firmly attached. Recently, I've found myself longing to run some Stormbringer for my fiancee, and the urge to pull out that map has been strong. In the name of having my cake and eating it, too, I figured I'd purchase a used copy of the 4E rule book on Amazon. They go fairly cheap in good condition, and I thought it'd be worth the $20 or so even if all I got out of the deal was the map. And no map. I know what you're thinking: Some previous owner pulled the map - you should have been prepared for that. Well, Mr./Mrs./Ms. Fancypants, I was prepared for that. But that's not the case. No, what appears to be the case is that the newcomer is a completely different printing than my existing book. It has a map, but it's the small, one-page map. Furthermore, the dozen or so rear pages in my book are on ivory paper (while the rest of the book's pages are white), but the newcomer's pages are all on white paper. Also, the newcomer's covers are different - they're textured, kind of like the texture of Fantasy Flight Games' boxes; my existing copy's covers are smooth. And the newcomer's back cover is slightly different - the bulleted copy above the bar code is different, and inside a white box. I at first assumed that I had a different printing - some sort of Stormbringer 4.5 or something. But the ISBN's are identical, and there's no indication anywhere in or on the book that the newcomer is from a different print run (except for the obvious differences in presentation). So my question to my oh-so-knowledgeable readers is: What the heck is going on? Did Chaosium do a different printing of this book, sans the excellent fold-out map? Did I just get lucky when I purchased my existing copy? Or, is this newcomer a knock-off? Maybe a print-on-demand copy? I did a lot of research before picking up the book in an attempt to make sure that there weren't variations of it floating around - I was fairly diligent in this, because I didn't want to end up with the wrong book. Nowhere did I see a reference to multiple printings, so now I'm wondering if I should feel poorly used by the seller. Anybody out there able to shed light on this? It would be cool if you could get a scan onto one of those sites to track the particular variation. Books published by mainstream publishers will indicate the printing by a line of numbers, usually under the copyrgiht notices and Library of Congress CIP, if any. The printer just removes the last # in the line with each subsequent print run. So the second printing has a 10 9 8 7 6 5 4 3 2. I would guess what you have are two different printings, if only the covers and added maps are different. If the text is different, different paging, etc...that is really a different edition. The back of the title page may well mention edition, printing, or even just copyright dates being different. @mikemonaco: Yeah, I'm well aware of the use of number lines to signify printings. As I said, there's nothing to indicate that this is a different printing of this edition (and there's no number line at all). The title page and verso are identical - which is why I'm so baffled. Chaosium has done POD reprints for many CoC titles, perhaps they had done so for Stormbringer as well, before Moorcock revoked the license. If you poke around on yog-sothoth.com you should be able to track down the differences, to see if they're the same differences you're seeing. This is really weird because I just got a bunch of books with an Amazon gift card and Stormbringer 4th ed was among them. I also only have the black and white small map so let me know if you find anything out here. 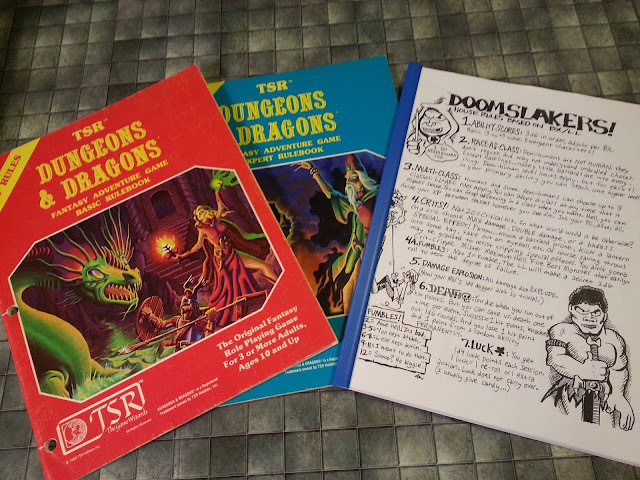 @Allan: "Chaosium has done POD reprints for many CoC titles..."
@Rich: Is there any indicator that there was - at one time - a map attached just inside the back cover? I have several of the CoC books that had maps bound within them, and they all still have remnants where the maps were once attached. I have some other feelers out regarding this mini-mystery - I'll be sure to let you know what, if anything, I uncover. Chaosium often did incremental changes within editions; the fifth edition Call of Cthulhu I know have is from a couple of years before my original copy, and while it is 99% identical, some of the stuff in the last few pages is different. I don't have my original copy to check the ISBN, but I'd bet they're the same. For Call of Cthulhu at least Chaosium would print the version number on the title page; my first one was 5.2 I think, while this one is 5.1.1. Chaosium also used to "farm out" rights to their books in different countries. I'm pretty sure that Games Workshop was their agent/publisher in the UK for many years. Have you maybe wound up with a UK edition? I'm fairly sure that the Games Workshop release was the third edition, and it had a new cover image of Elric on a horse riding towards the reader. uh, I have a complete copy of the 4th edition Stormbringer, slightly dinged at the corners, probably from age as, other than what appears to be a drip of hot chocolate on the cover, I don't recall using it. I had and preferred the GW (3rd) edition in hardback. I bought the 4th when the spine dropped off of that one. However they'd changed something and so I kept on using the 3rd. I also still have that somewhere. Last time I was visiting my parents I raided the 4th ed from their loft on the grounds I was unsure the 3rd would survive the trip back in my suitcase. I am very much tempted to call them and see if they can find and mail me my 3rd ed copy. If so then I may easily be persuaded to part with my 4th ed copy for some reasonable consideration. When I say complete I mean, probably not read more than a few times, spine is uncreased and the map is in place (along with the blue Chaosium mail order card between pages 168 and 169). This clears up some of the mystery, and if you look at the comments the only commentator suggests there are 3 variations of the 4th edition. "Lightning Print" - sounds like POD to me.